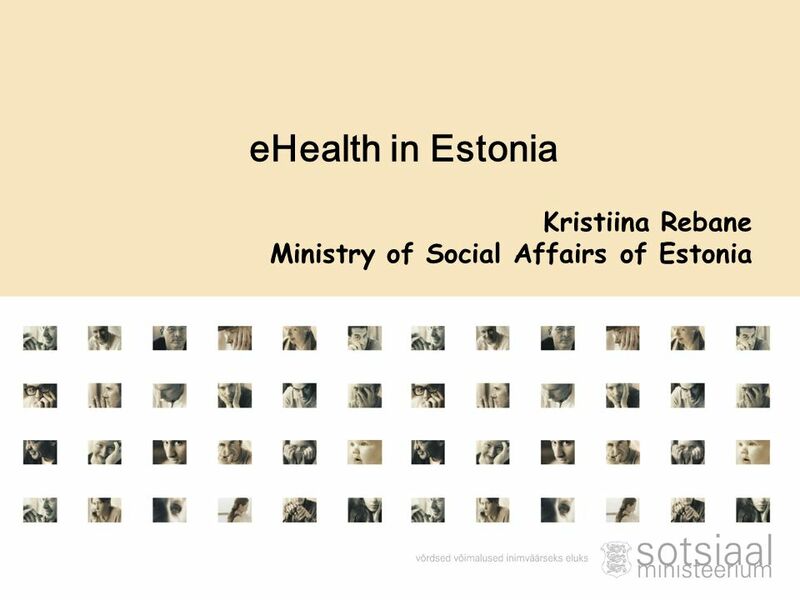 Kristiina Rebane Ministry of Social Affairs of Estonia eHealth in Estonia. 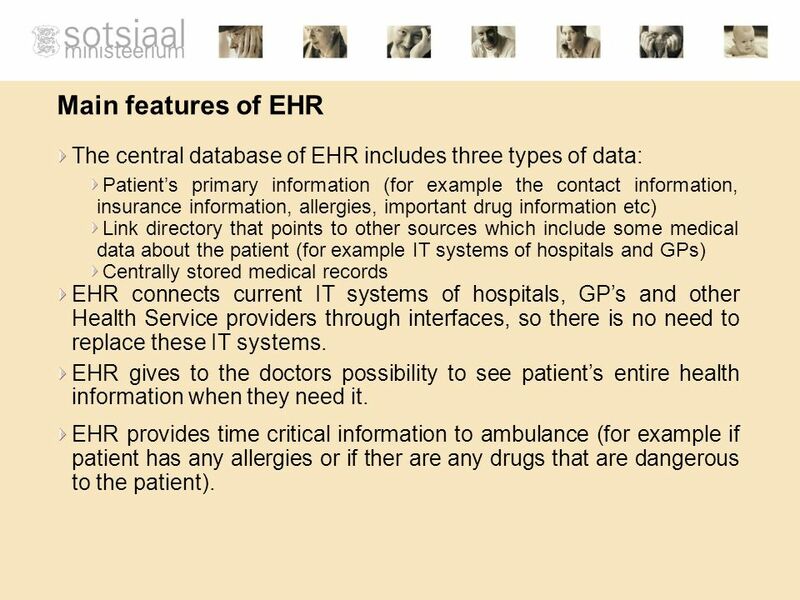 13 Main features of EHR The central database of EHR includes three types of data: Patients primary information (for example the contact information, insurance information, allergies, important drug information etc) Link directory that points to other sources which include some medical data about the patient (for example IT systems of hospitals and GPs) Centrally stored medical records EHR connects current IT systems of hospitals, GPs and other Health Service providers through interfaces, so there is no need to replace these IT systems. 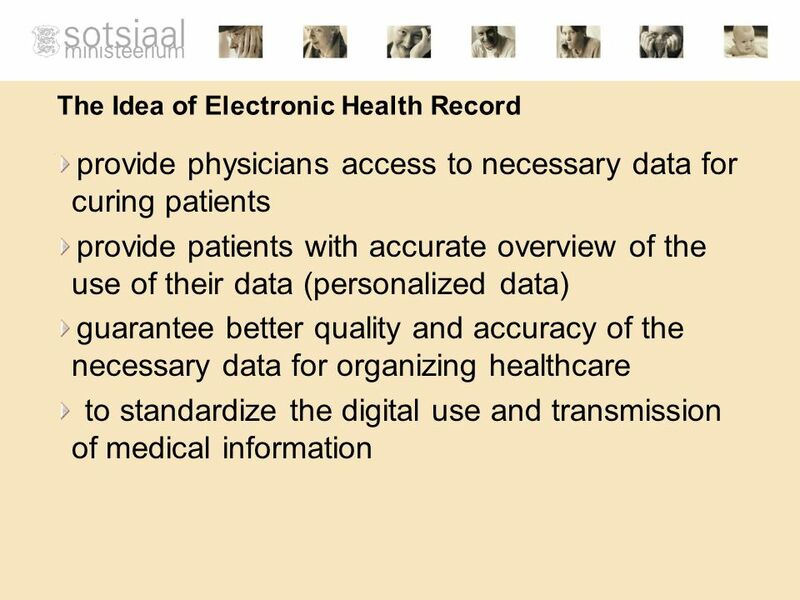 EHR gives to the doctors possibility to see patients entire health information when they need it. 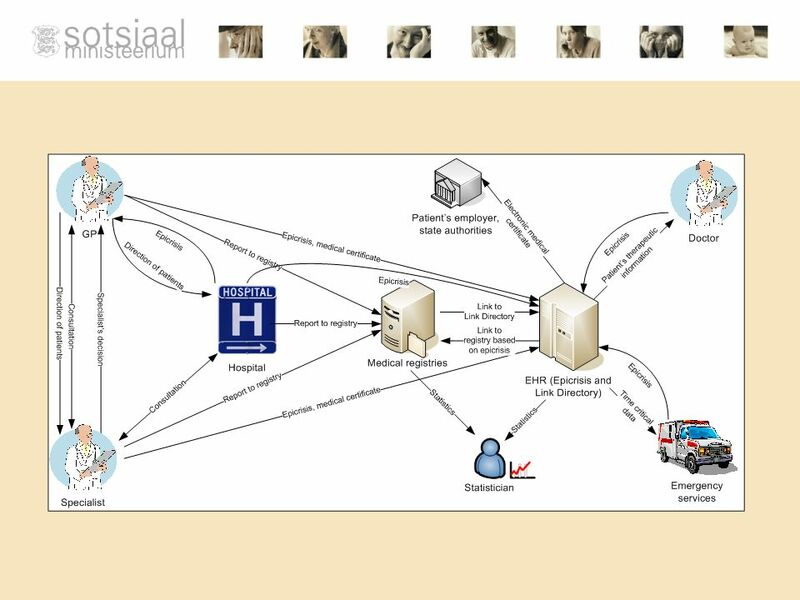 EHR provides time critical information to ambulance (for example if patient has any allergies or if ther are any drugs that are dangerous to the patient). 14 EHR also acts as patients inoculation journal. 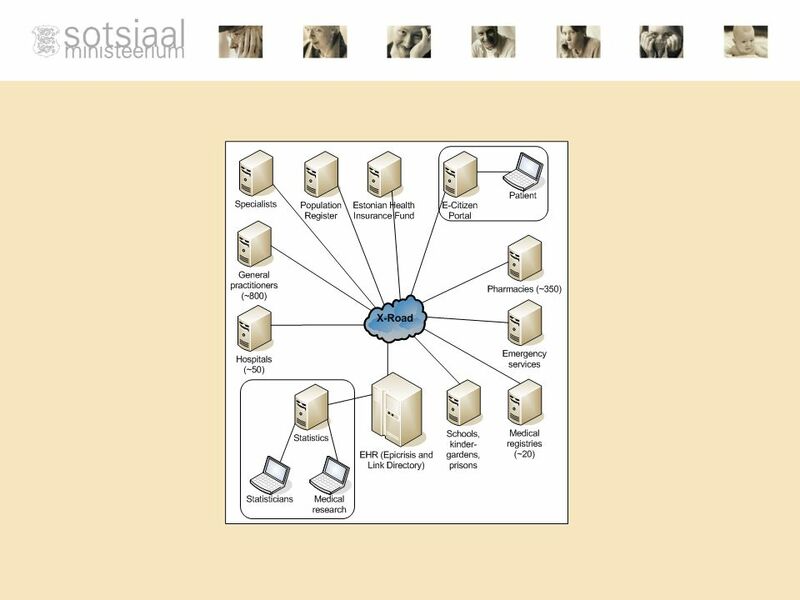 GP can send patients medical information through EHR system to the specialist who treats the patient. The patient doesnt have to carry any papers himself. 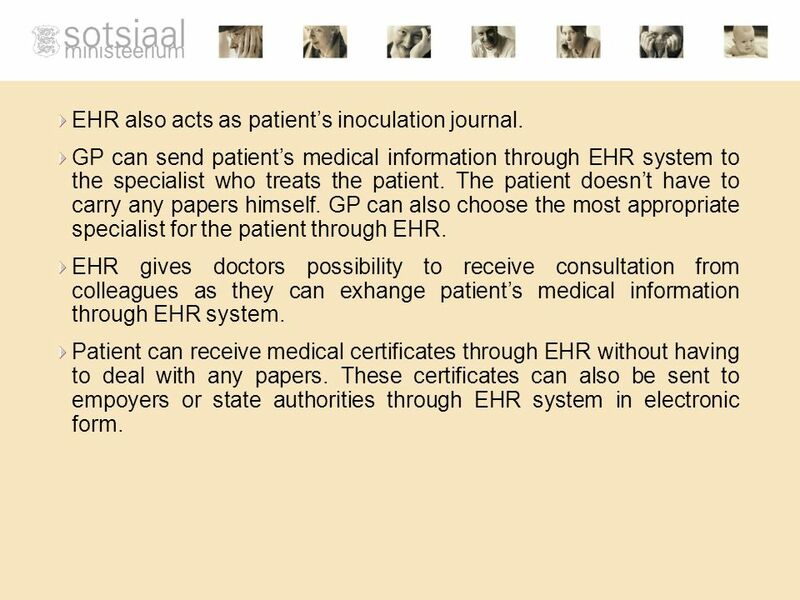 GP can also choose the most appropriate specialist for the patient through EHR. EHR gives doctors possibility to receive consultation from colleagues as they can exhange patients medical information through EHR system. Patient can receive medical certificates through EHR without having to deal with any papers. These certificates can also be sent to empoyers or state authorities through EHR system in electronic form. 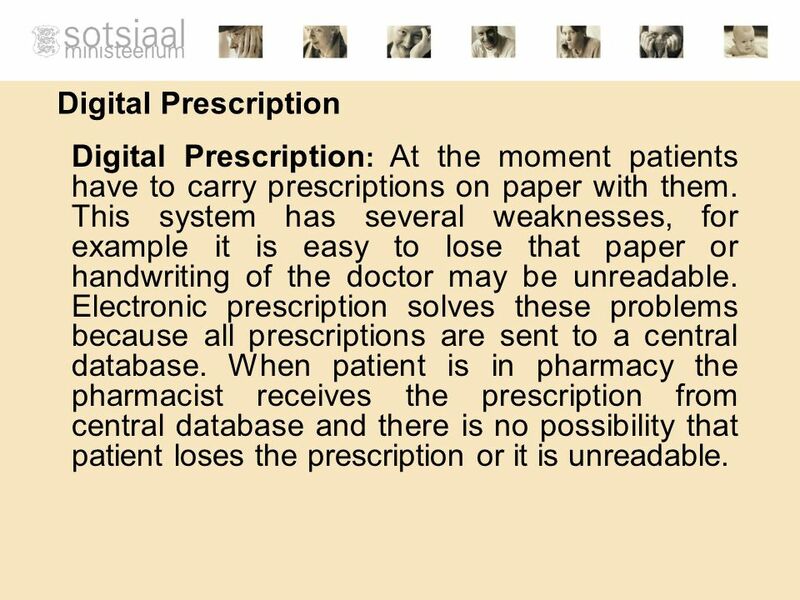 17 Digital Prescription Digital Prescription : At the moment patients have to carry prescriptions on paper with them. This system has several weaknesses, for example it is easy to lose that paper or handwriting of the doctor may be unreadable. Electronic prescription solves these problems because all prescriptions are sent to a central database. 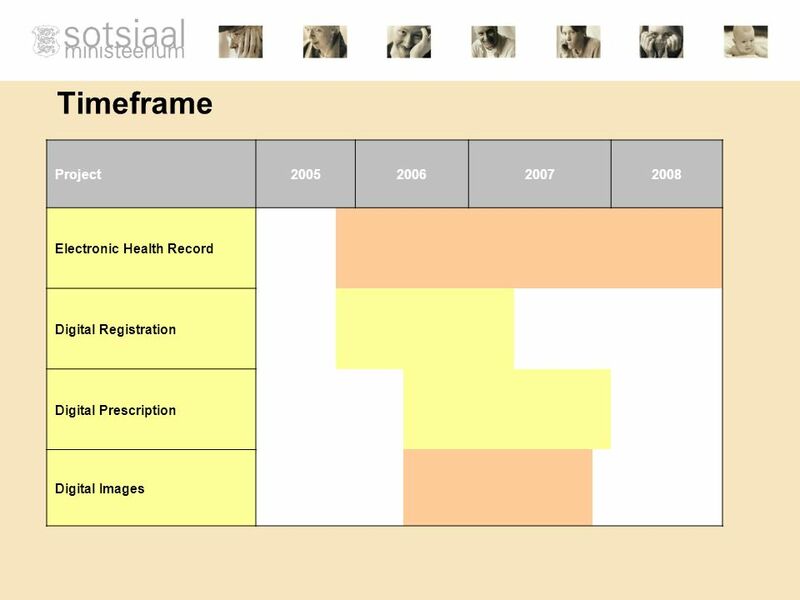 When patient is in pharmacy the pharmacist receives the prescription from central database and there is no possibility that patient loses the prescription or it is unreadable. 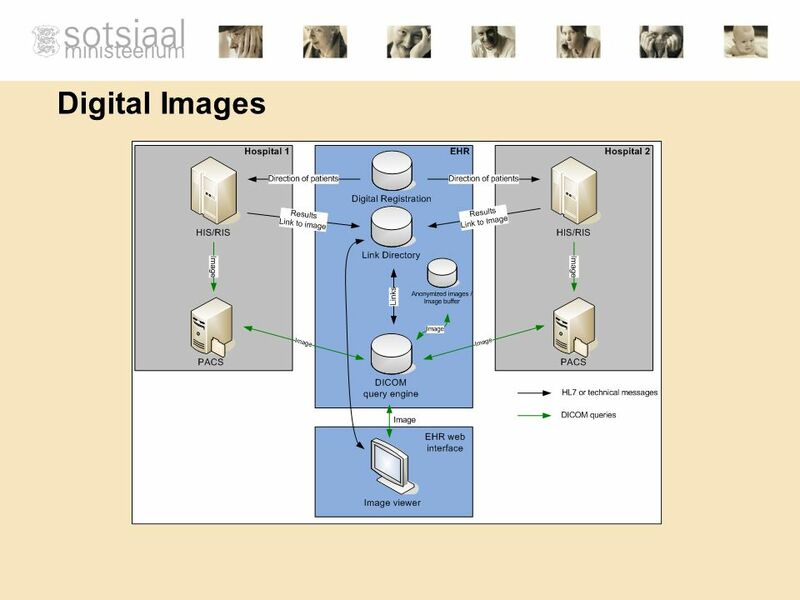 18 Digital Images Digital Images: nowadays most of the devices in medical diagnostics have the possibility to give the output in electronic form (for example as picture or video). 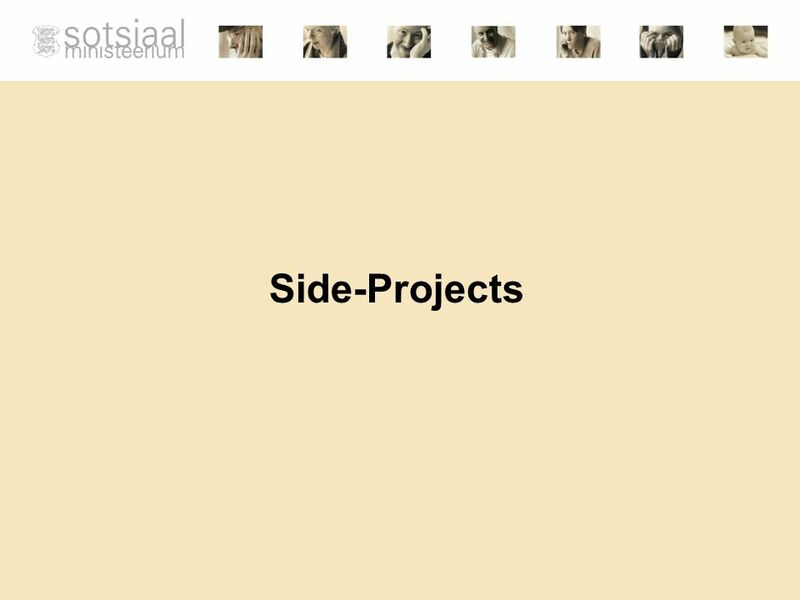 At the same there are lot of databases to store these images. 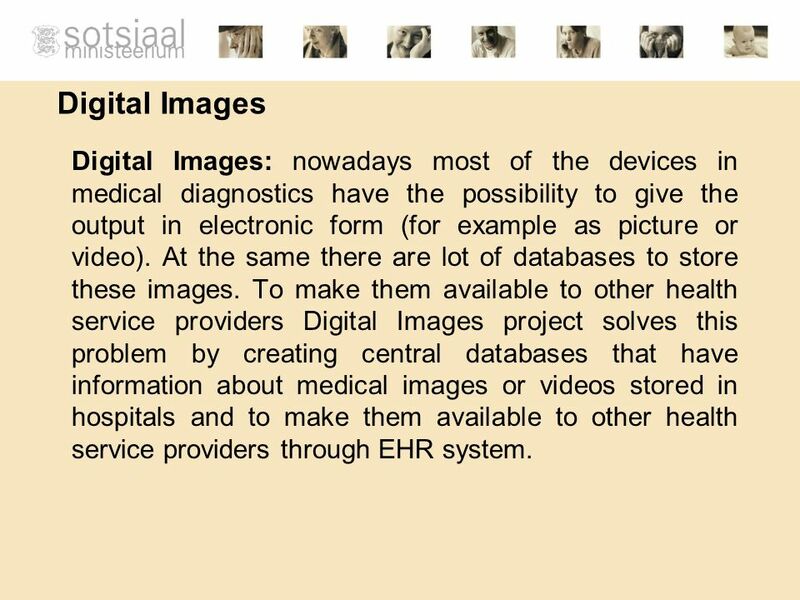 To make them available to other health service providers Digital Images project solves this problem by creating central databases that have information about medical images or videos stored in hospitals and to make them available to other health service providers through EHR system. 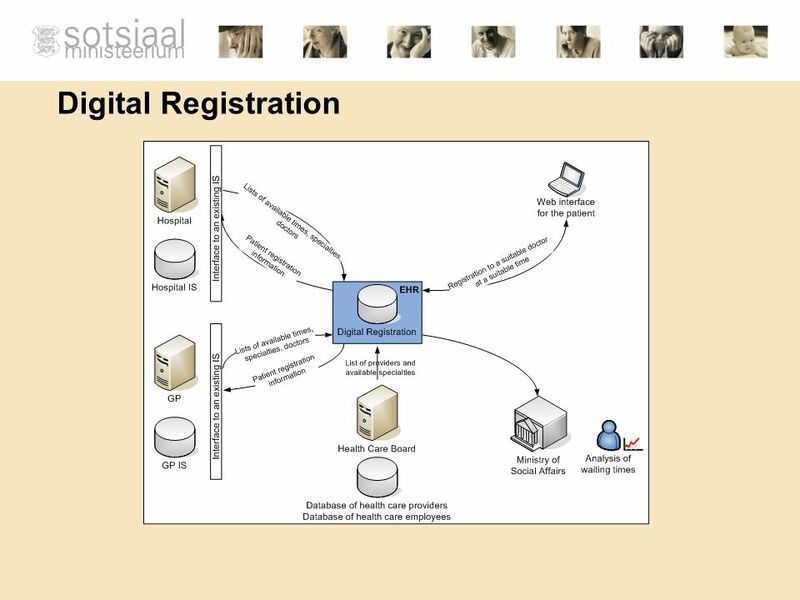 20 Digital Registration Digital Registration: At the moment several health service providers have their own electronic registration systems, which cannot communicate with each other, but large part of service providers have no electronic registration systems at all. 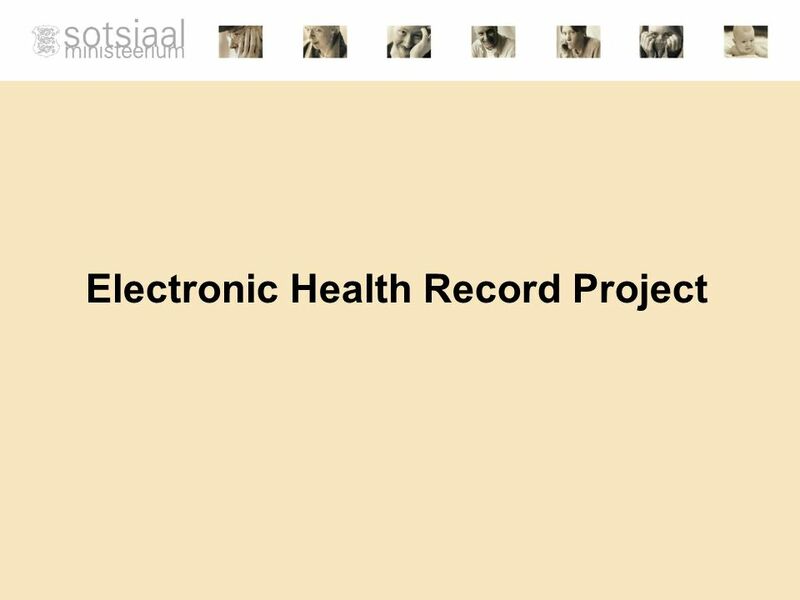 Electronic Registration project creates common standards for all health service providers and connects their electronic registration systems to one central website. 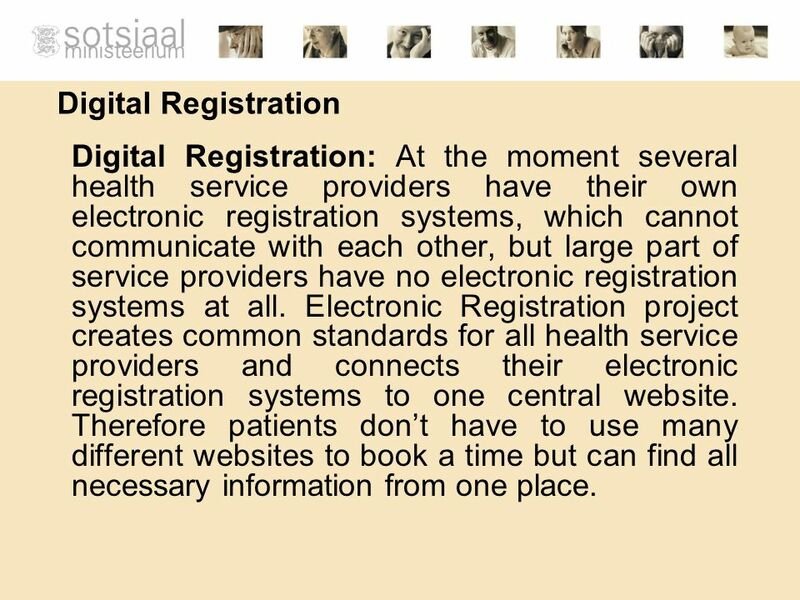 Therefore patients dont have to use many different websites to book a time but can find all necessary information from one place. 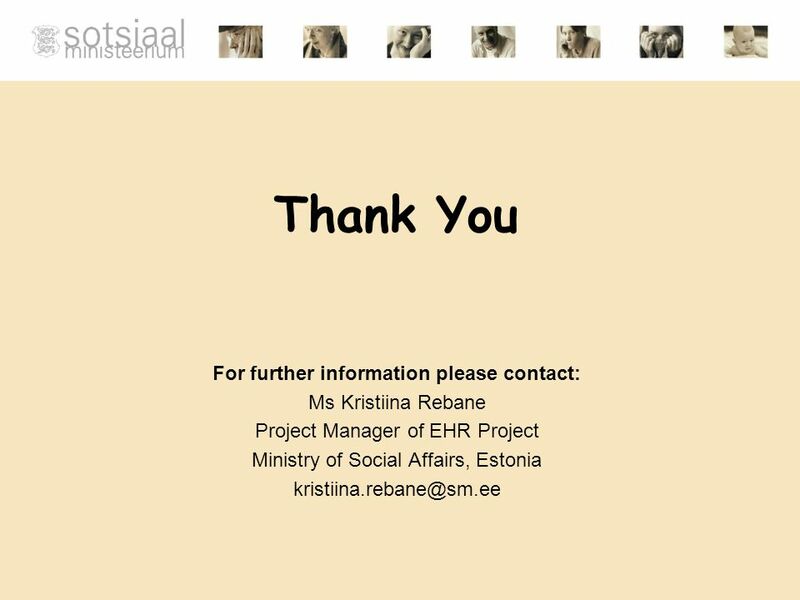 Download ppt "Kristiina Rebane Ministry of Social Affairs of Estonia eHealth in Estonia." 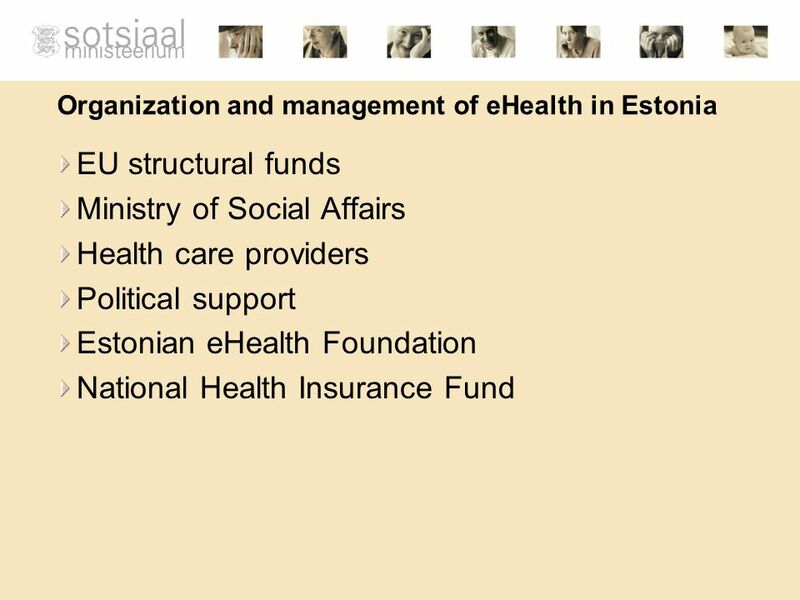 Confidential RISK ADVISORY SERVICES Latvijas Republikas Veselības ministrija Healthcare Information System Policy in Latvia Rinalds Muciņš, Ministry of. 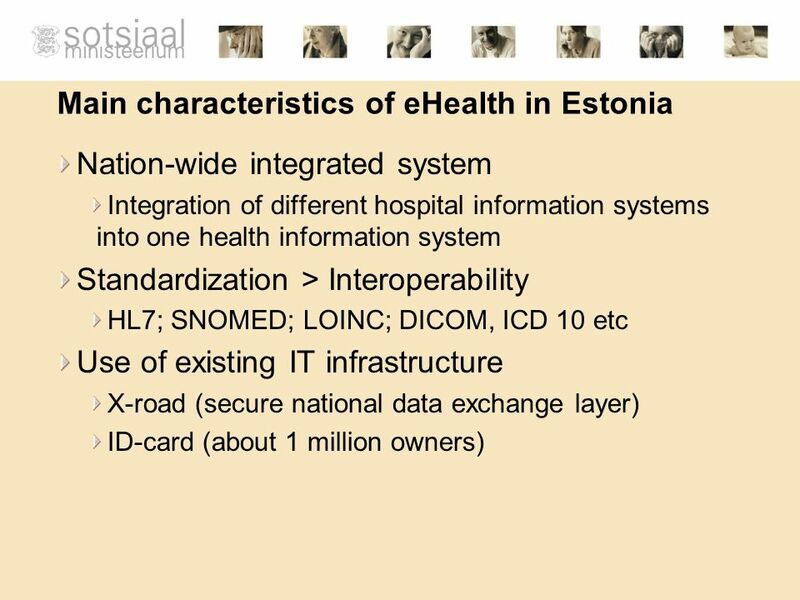 1 HL7 Educational Session – eHealth Week Budapest 2011 © Health Level Seven International, Inc. All Rights Reserved. HL7 and Health Level Seven. 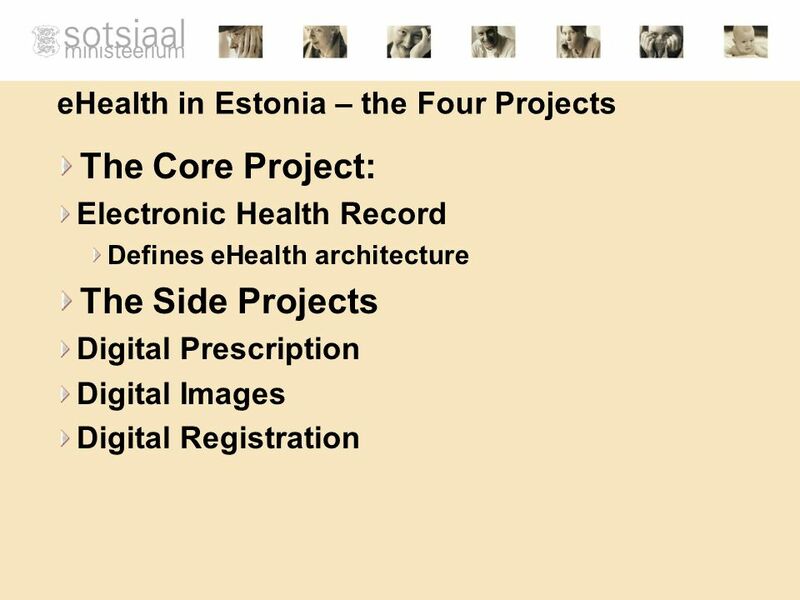 Estonian Health Information System Raul Mill Estonian eHealth Foundation. Certification The Belgian experience and a look forward…. Dr JP Dercq Research Developement and Quality, Health National Insurance Belgium. Massachusetts: Transforming the Healthcare Economy John D. Halamka MD CIO, Harvard Medical School and Beth Israel Deaconess Medical Center. 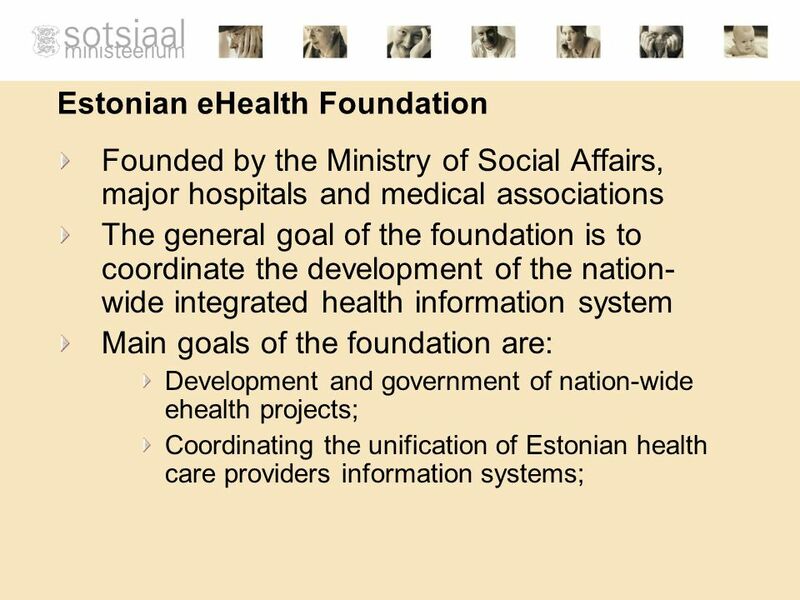 Directorate for Health and Social Affairs Action Plan 2001 – 2003 : Electronic interaction within the Health and Social Services. Interoperability in the Collaborative Medical Information Systems Dragan Janković, Ivica Marković Faculty of Electronic Engineering University of Niš. 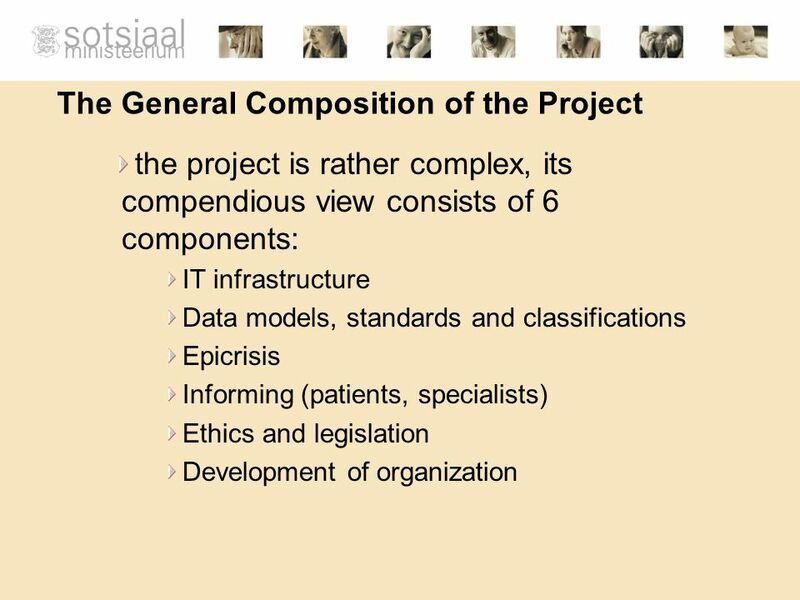 A Primer on Healthcare Information Exchange John D. Halamka MD CIO, Harvard Medical School and Beth Israel Deaconess Medical Center. 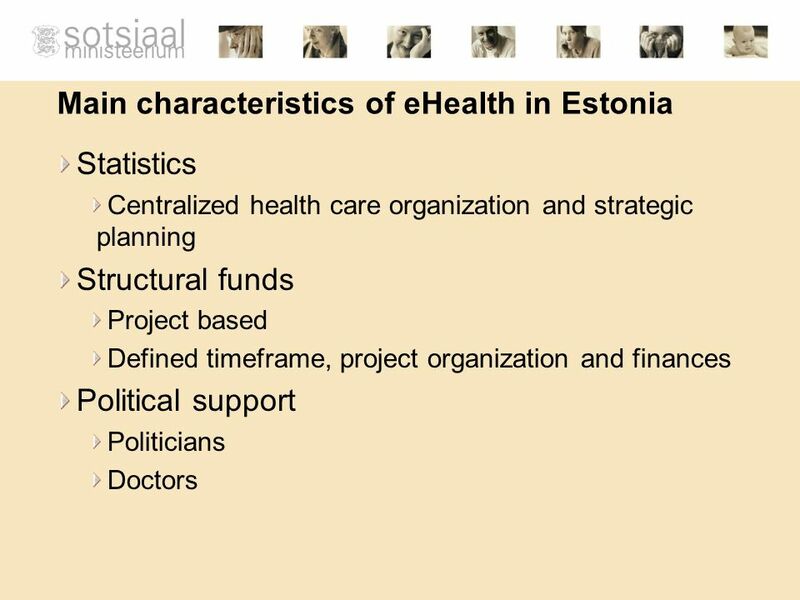 Dr Ivi Normet Deputy Secretary General on Health Ministry of Social Affairs Health Care and E-Health system in Estonia. 1 of 1 E- Health in the European Union Dr. Andrzej Rys Director for Health and Risk Assessment DG SANCO European Commission OPEN DAYS 2009 Mobility in. 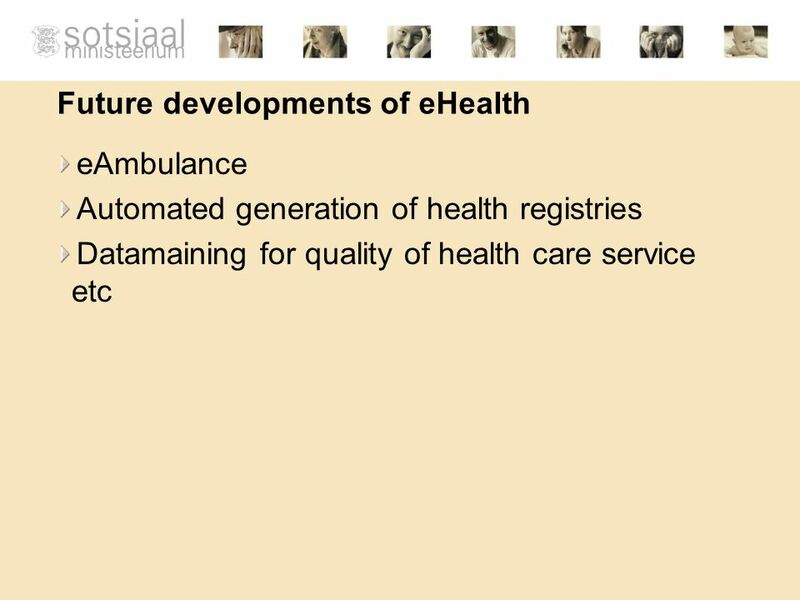 FOR THE DOCTORS OF TODAY & TOMORROW OVERVIEW Next Generation application Innovative, intelligent, simple and user friendly End to End solution Secured. Hetty Khan Health Informatics Scientist Centers for Disease Control and Prevention (CDC) National Center for Health Statistics (NCHS) August 7, 2012 Developing. Data-Processing Centre (DPC) for the health care system in the Sverdlovsk Oblast Andreas Lux Substantive provisions of the concept Moscow January 25 th. The National Health Service Healthcare in the United Kingdom By Vruti Dattani University of Cambridge. 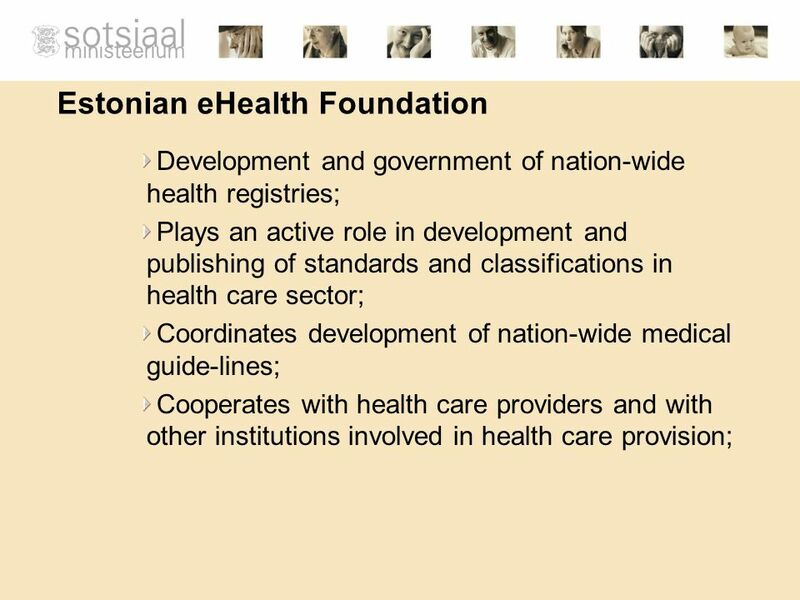 E-Transformation Turkey & National Health Information Systems Datasel Bilgi Sistemleri A.S, Turkey 1.